One of the beauties of Applescript is that you don't have to install anything, the standard Mac OS X install includes everything you might need to get started. 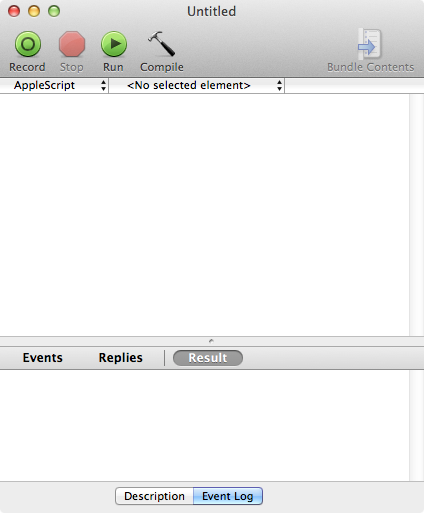 If you look in the Applications folder you will see a folder called Applescript, in there is the Script Editor application. Doubler click on it to open it and you should see a window like this. If you now control-click (or right click) on the script editor window you get a menu listing all the script editor scripts that are avaiable. Many of these are part of the standard install whilst others might be installed by specific applications. They are all in a folder in Macintosh HD/Library/Scripts/Script Editor Scripts and you can add scripts or folders here and they will appear in the menu. Whilst the standard install includes a variety of useful and frequently used routines if you are writing scripts that interface with UNIX applications then having access to the POSIX paths to some of the standard folders is a regular need. The following script is simply a modification of one of the scripts provided by Apple. First we get the path to the desktop and then convert it to a POSIX path. The text can then be inserted into the script or used to replace the highlighted text in the script. 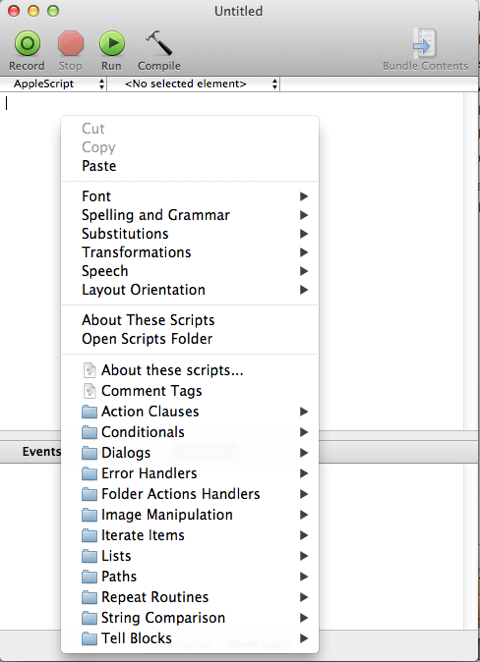 Save the script as Posix_path_to_desktop and put it in the Macintosh HD/Library/Scripts/Script Editor Scripts folder (I actually created a folder called Paths and put it in there). set the target_string to "X-X-X"
if my display_message() is false then return "user cancelled"
lookup anchor this_anchor in book "Script Editor Help"